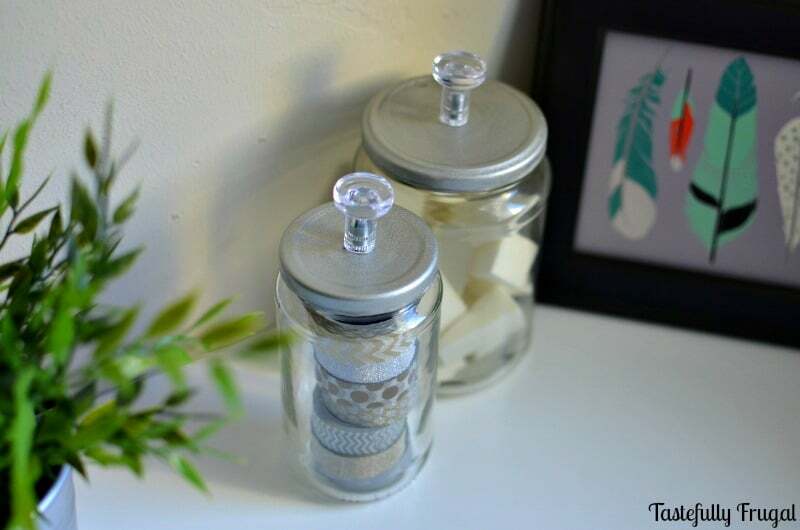 Don’t throw those empty pickle jars away; make these cute storage containers for less than $1. I remember when I was 9 months pregnant with my first son, waiting every day for him to join our family (he was a few weeks past his due date) I stumbled upon this great website, Pinterest. I spent my days filling boards full of all these cute baby things, crafts and recipes that I knew I would have time to do now that I was a stay at home mom. Boy, was I wrong! That was 3 years ago and while I have gotten a ton of recipe inspirations from Pinterest I have only done a handful of the hundreds, well really more like thousands, of crafts and projects I’ve pinned. So when my sweet friend Kendra from Joy In Our Home invited me to join this Monthly Pinterest Challenge group I knew it was just the motivation I needed to tackle some of these projects. Moving from a 3 bedroom house to a 2 bedroom town home one of the areas I can use the most help in is organization. I’ve seen those cute storage jars with the glass knobs on top for years and decided that would be my first Pinterest Challenge to tackle. I looked at Home Depot and Lowe’s and a few online stores and the cheapest I could find those cute knobs for was $3. Now three dollars doesn’t seem like a lot of money but I knew I could find something even more affordable. So when I was at IKEA the other weekend and saw these Clear Satta Knobs I knew they would be perfect; especially since they were just $1.99 for 6. So with knobs, a few empty jam jars and pickle jars, and a can of Rustoleum Metiallic Paint & Primer in Satin Nickel in hand I was ready to make my jars. The only other tool you may need is a Center Punch to make the whole in the lid. My husband had one already but you can buy them at anywhere hardware store. Step 1: Clean jars and remove labels. I found the easiest way to get the labels off without having any sticky left over is to run the jars under warm water and use your fingers to scrub off. 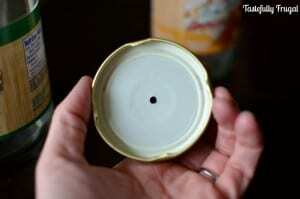 Step 2: Use the center punch to poke a whole through the middle of the lids. Step 3: Paint lids and let them sit overnight. Step 4: Thread screw for knobs up through the bottom of the lids and attach Satta knob on top of lid. Step 5: Fill your cute jars with whatever you have lying around that needs to be organized. The jam jars are perfect to hold washi tape and the pickle jars are great for makeup wedges, which my boys and I love painting with (another Pinterest tip). Where could you use a little extra organization? And for more fun Pinterest inspiration check out what my friends Havalah from Sisters, What! 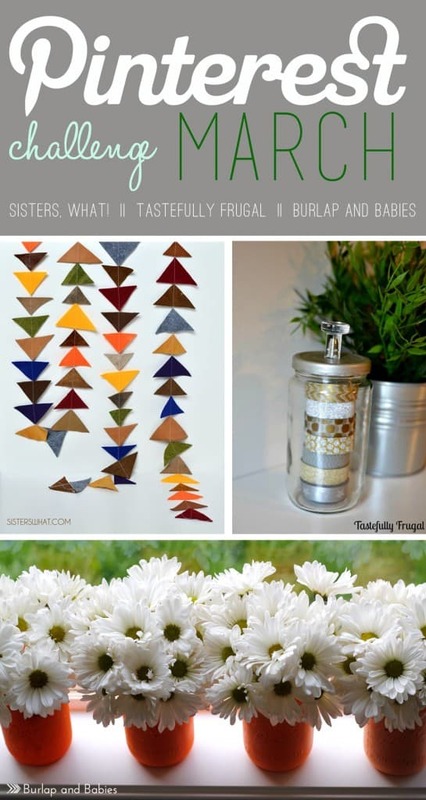 and Amanda from Burlap and Babies made this month! DIY Felt and Leather Triangle Garland || Sisters, What! I love that the jars are left over from the kitchen yet they totally don’t look like it after the fact. So fun having you join in on the challenge this month. I love your jars you did a great job with them. I love the clear knobs I can’t believe you only paid $1.99 for 6 that’s a super deal! Thanks for sharing your cute project. Pinned!!! Those are perfect. Love the price tag! Also, where did you find such cute washi tape?! Ah thank you so much Melanie!! I got the washi tape from Pick Your Plum 🙂 I hope you have a great week! These are so cute! I love how frugal they are as well. Thanks for sharing at the Homestead Blog Hop! Thanks so much Angi! I am all for making things as inexpensive as possible! 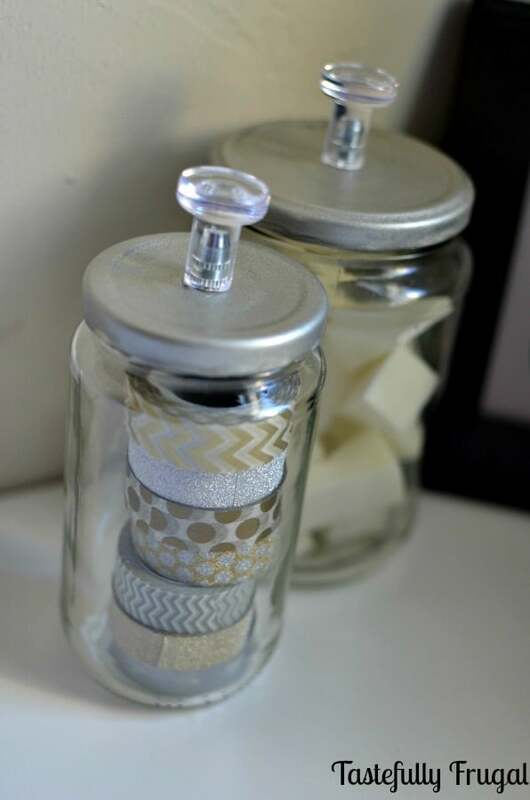 I’ve pinned various versions of this cute storage jar idea too and do plan to try it some time soon. Yours came out very classy. Love all your washi tape collection too! Ah thanks Julie! I know, when I was looking for project ideas for this I had pinned at least 10 different variations so I knew it was time I made them. What a great idea for storage! I love taking old items and reusing them! Thanks so much Ruthie! I love reusing things too… Thanks for visiting! These are so cute! I love the knobs! Thanks so much Meg! They are my favorite part too! This is sooo cute. I am a jar hoarder, I mean collector, and this is a great project. 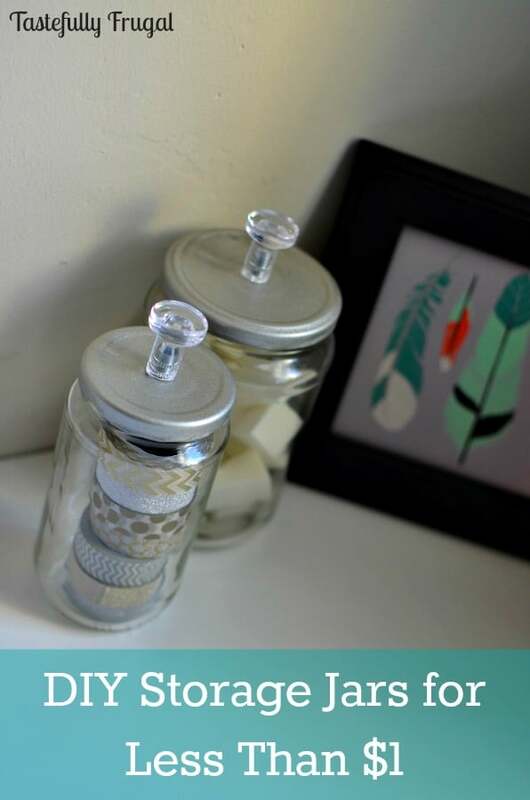 I love these cute jars and they are so versatile for any room or area. Sydney I love your jars! I can’t believe you did all of that for a buck! what a great way to store all those little items! Thank you for sharing! These are perfect, Sydney! Such a cute idea! What a neat way to repurpose old jars! I love how these turned out! The knob adds a great touch. I like when items are functional and pretty – like displaying your washi tape!